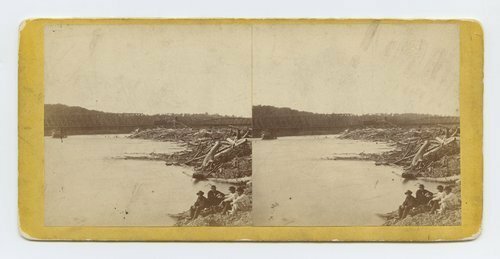 This stereograph shows a railroad bridge across the Kansas River at State Line, Kansas. There is a locomotive crossing the bridge and along the banks are logs that have washed up on shore. It is from Alexander Gardner's series, Across the Continent on the Union Pacific Railway, Eastern Division.